Armageddon was an infamous staple of Magic’s early core sets. The strength of the card lay in its surprising degree of asymmetry: it destroys all lands, yes, but it says nothing about what you do as far as creatures or other spells in the meantime. The classic play with Armageddon was to get ahead of the opponent in creatures and/or mana-producing artifacts and the like, then use the “symmetrical” effect to ensure they would not be able to do anything about it. Realm Razer is a good card because it includes both parts of that combo in one. The opponent can theoretically get their lands back, but it’s likely to be hard for obvious reasons. When this guy was in Standard, there were also quite a few relatively cheap mana creatures and artifacts and he also seemed relatively fragile for his cost; not to mention in the face of cards like Path to Exile and Magma Spray which were easy to cast with mana floated in response. Despite this, he can easily lock out an opponent who is not expecting to have to deal with such an effect, and he can definitely find a place in larger formats. Realm Razer is infamous in my play group. In single player this guy’s ability can win games and in multiplayer this guy can make a lot of people hate you. Much like Wrath of God, there’s a good time and a bad time to cast this card. If you have board advantage or a self-sustaining combo, dropping this big guy is pretty much GG. Heck, why not combine Wrath with Realm Razer and let it stomp around for a few turns. The nice thing about this behemoth is that 9/10 times your land will untap first, giving you the advantage… to play a second Realm Razer! Landfall cards love this guy as well. The downside is that Realm Razer is a bit frail. Fortunately being Green and White means you have access to various forms of buffs and protection. Its a bit unconventional but Realm Razer plays great with Eldrazi. No lands means your opponent has to sacrifice valuable permanents to Annihilator, often losing the game with no cards on the table. Oblivion Sower is just rude when combined with Realm Razer. But how do you cast Oblivion Sower with no lands? That’s what the Eldrazi Spawn tokens are for. I love Realm Razer to pieces. You have to play it smart but the results are well worth it. Hello, Mister Biggles. Realm Razer is one of those explosive spells that does some interesting things; it easily could have been a mythic in Shards of Alara. Let’s start with the most obvious application: get rid of all the lands, so that you can have free rein to smash and bash to your heart’s content. 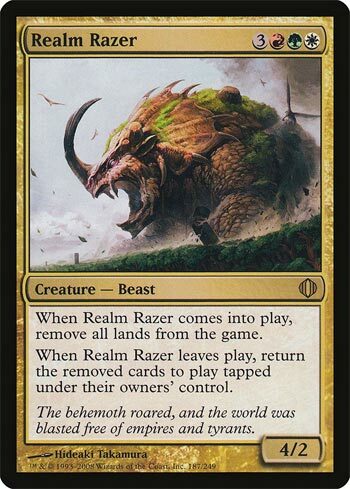 Realm Razer itself is not well-suited to closing out games, as only a 4/2 with no protection or combat abilities to speak of, but it plays well into aboard already packed to the brim with fun creatures. Cast it, remove the ability to respond, and smash face. Seems simple. The other application is to pair Realm Razer with a blink or removal spell on cast to act as a more-permanent Armageddon. The wording on Realm Razer is one they’ve largely eschewed, thanks to the weird interaction. How it works, basically, is that if you remove Realm Razer before the first ability (the exile all lands ability) resolves, the second ability (the return them to play ability) resolves first. With that resolved, the mass-exile is free to go off, and all the lands will disappear like that. It’s a telegraphed combo, but one that can be brutal if you have the set-up to make it work. Realm Razer is an expensive combo piece that can help you close out games and lose friends. It’s a powerful effect, but on a fragile body. Use with care.